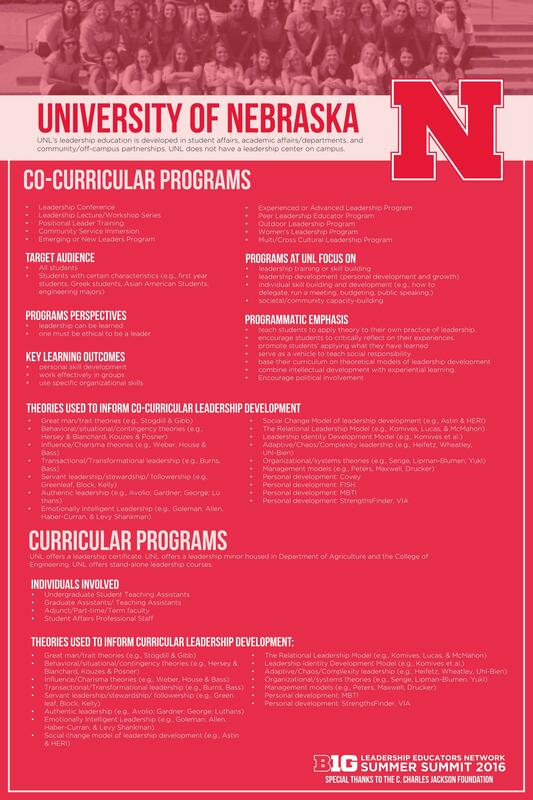 The Leadership Educators Network Summit (LENS) is an annual gathering of both curricular and co-curricular leadership educators across the Big Ten institutions. 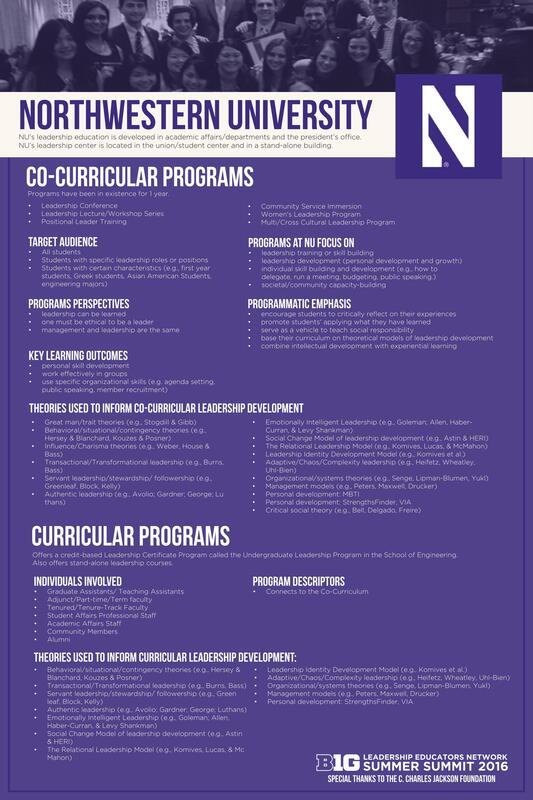 We established a network of Big Ten leadership educators to understand who we are as leadership educators, the context of our work, and how we can advance leadership education in the field, efficiently and effectively, through student-centered exchanges, knowledge sharing and collaborative problem solving. As leadership educators we have the opportunity to impact over a half a million students each year. By coming together annually, we are better able to create more meaningful, relevant, and effective programs across the Big Ten institutions. 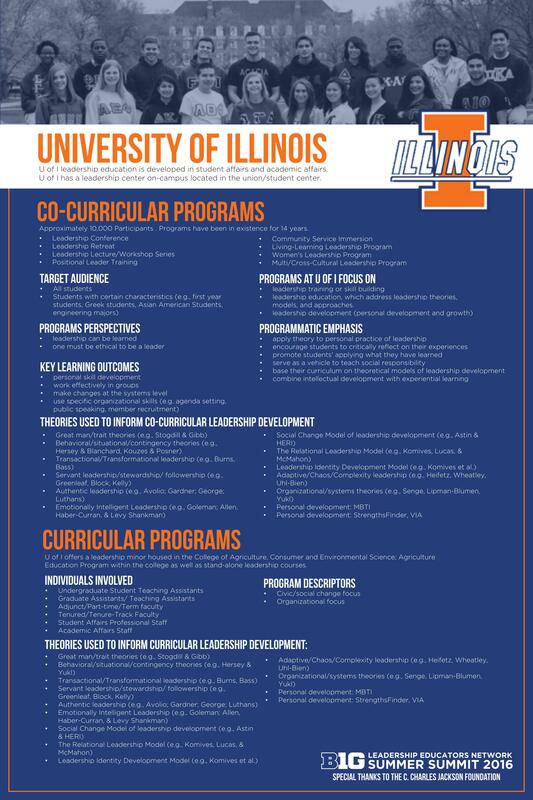 The Illinois Leadership Center is committed to developing and enhancing the leadership skills of all students through assessment, learning, and experiential opportunities. In addition, the Center supports faculty and staff who are pursuing leadership-related teaching, research, and student engagement activities. The program is based on a philosophy of non-positional leadership and a process of exploring values, honing leadership skills, and becoming an inclusive leader. The Center for Student Involvement & Leadership is committed to the leadership development of all UI students. 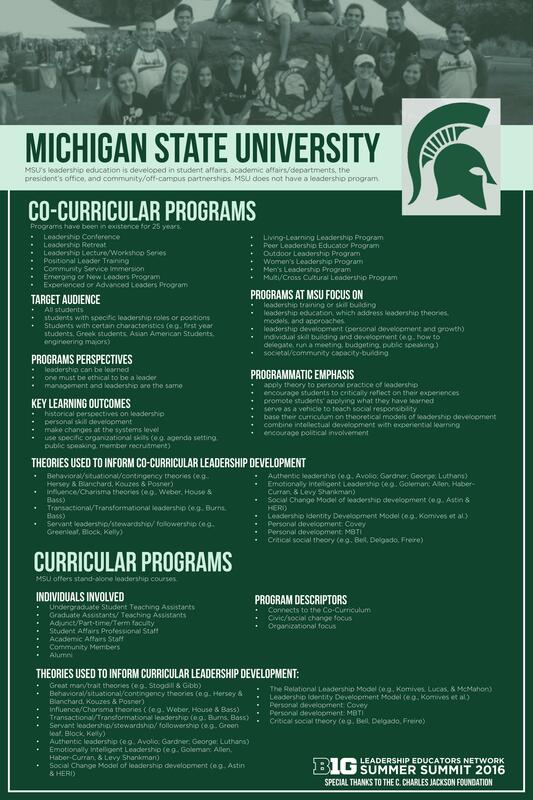 CSIL offers several opportunities for students to advance their leadership skills. Students can enroll in for credit academic leadership classes to discover more about leadership and the skills necessary for effective leadership. Students learn about leadership models and develop a personal philosophy of leadership. Student leaders are encouraged to take part in many leadership activities throughout each semester. 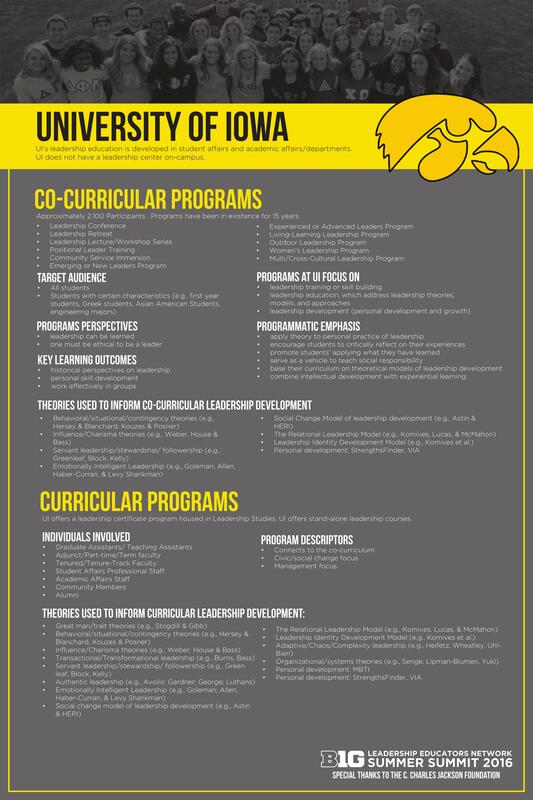 The Leadership Development Series and Student Leadership Institute are great ways for campus leaders to network, share ideas, and work to create positive change at the University of Iowa. Leadership & Community Service-Learning (known to most as LCSL) is a unit within the Adele H. Stamp Student Union- Center for Campus Life. LCSL engages students in leadership development and service-learning opportunities that foster transformative learning and social change. 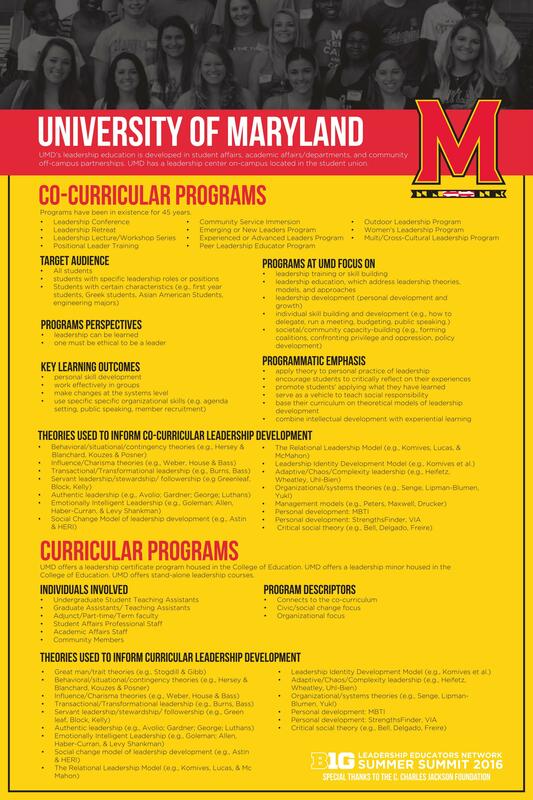 LCSL consists of 5 main program areas that are open to and designed for all UMD students, regardless of affiliation, major, identity or status. As a result, dialogues, classrooms, relationships, and learning environments with LCSL are opportunities for diverse students and staff to share perspectives, ask critical questions, and engage meaningfully with each other. 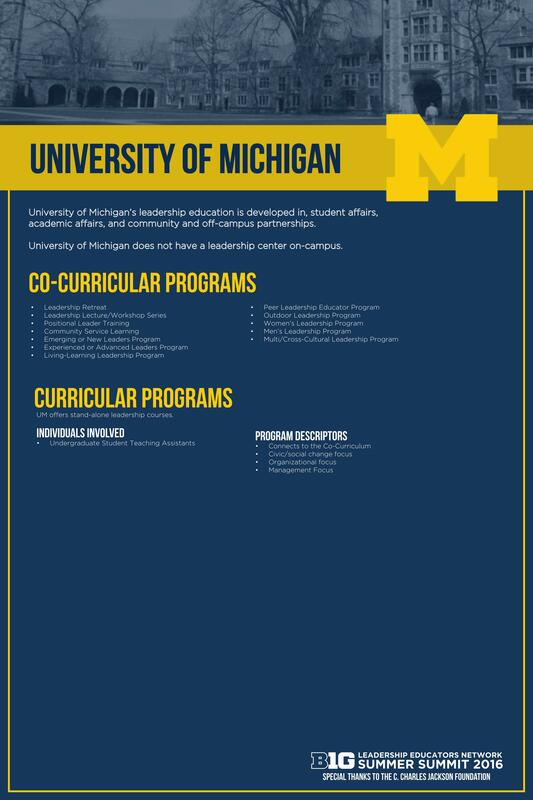 The Michigan Leadership Collaborative is a community dedicated to advancing leadership learning and removing institutional barriers for students who seek to develop and progress as leaders. The collaborative is comprised of staff and faculty from across the university that offers leadership education to students. We believe that everyone has the potential for leadership, at any point in their college experience. 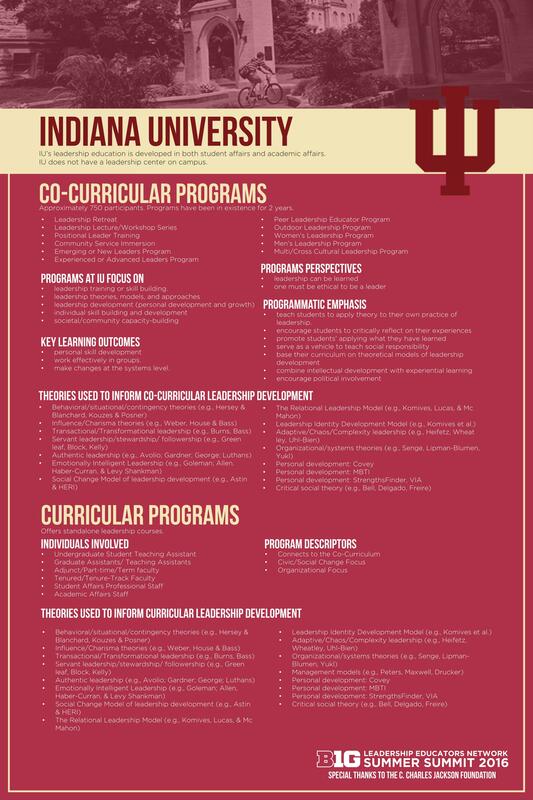 Our goal is to help you create an integrated and coherent leadership experience that enhances your knowledge and is connected to your academic course of study. Our leadership development programs are a combination of experiential learning opportunities, skill development, and self-assessment programs. We believe that once a student leader understands and knows themselves and their leadership style, they then have the potential to exert great influence on their organizations, work environments, and future communities. 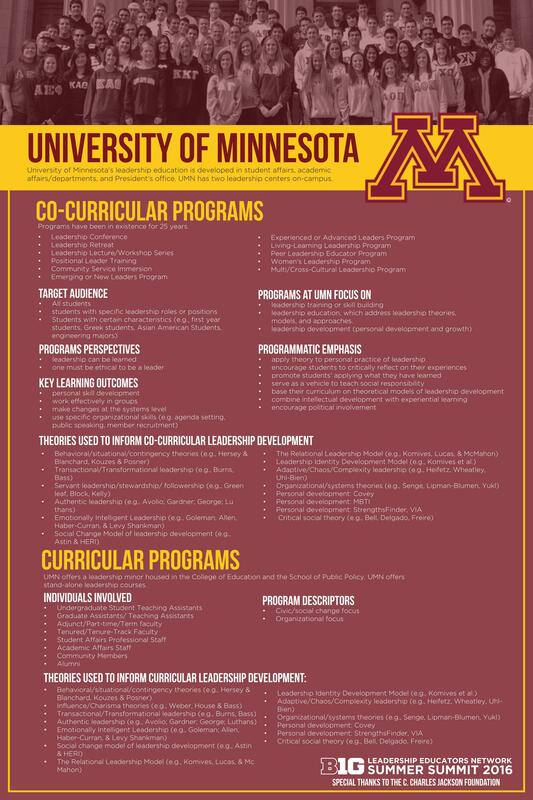 LEAD-UP provides a wide variety of leadership opportunities for undergraduate students at the University of Minnesota. The programs and resources are designed to provide you with real-world leadership training and experience, often beyond campus and within the greater Twin Cities community. 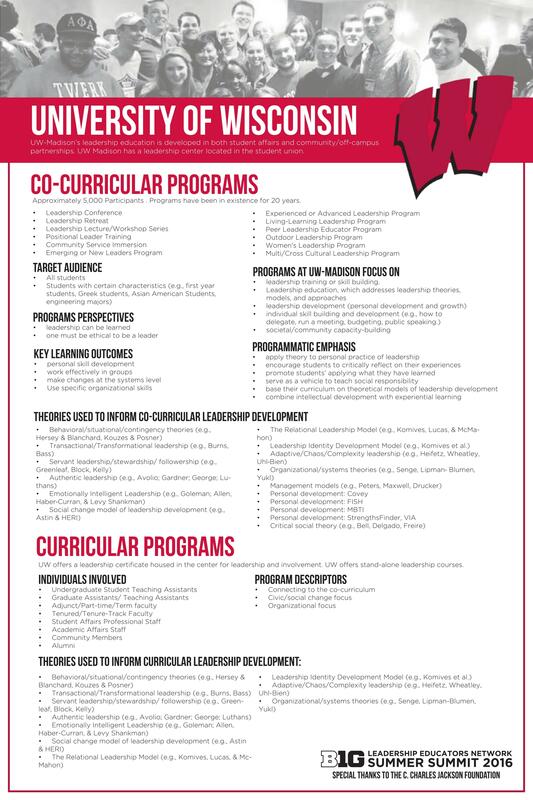 Initiatives range from the academic Leadership Minor to group based Leadership Enrichment Programs. The Leadership Education Program is designed to develop students for training and leadership positions in organizations and agencies involved in the agriculture industry. 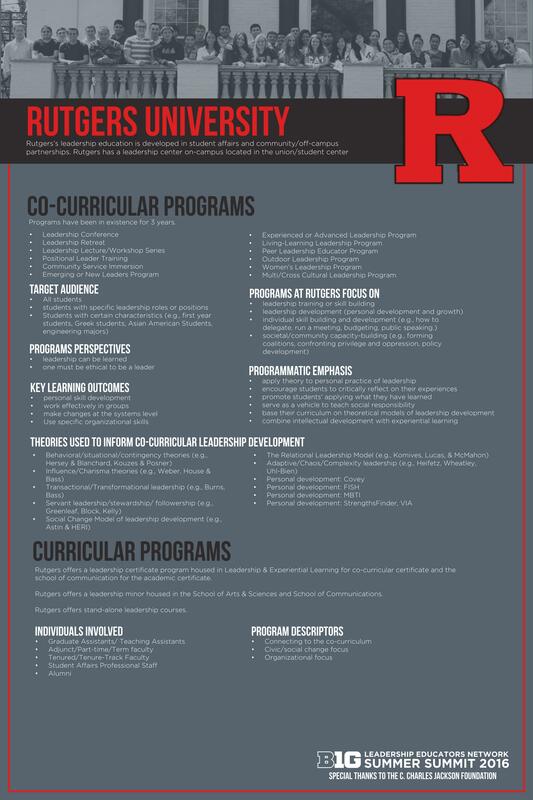 The curriculum focuses on the development of communication skills, teaching strategies, and leadership capabilities within various contexts in preparation for community roles. The Division of Student Affairs, as well as multiple additional units on campus, have committed to the common agenda of the Leadership Framework as our guide for creating and implementing programs intended to support students’ leadership development. Through the mutually reinforcing activities of multiple departments and shared assessment, we will increase students’ learning and development of their leadership capacity. Leadership Development & Community Engagement will serve as the backbone organization for this effort by supporting a community of practice (the Leadership Collective Impact Group), leading the centralized assessment efforts, and building resources for students and staff. 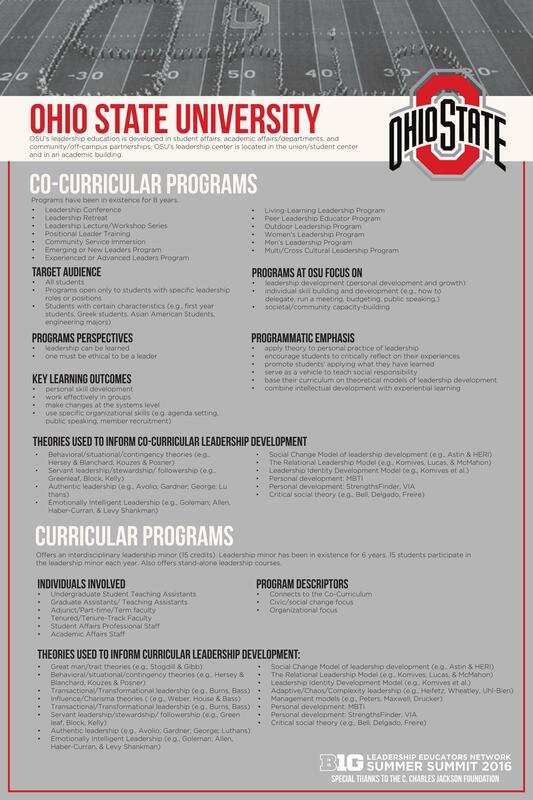 The OSU Leadership Center is led by a group of professionals dedicated to providing leadership-centered education and research to individuals, organizations and communities. We provide high-quality, practical programs to build and strengthen leadership capacities, and we offer an in-depth collection of leadership-related resources for loan. Through the creation and implementation of a comprehensive Leadership Development Program, Student Activities demonstrates its support of the mission of the Division of Student Affairs to prepare students to be effective, ethical leaders, and active citizens who can make a positive difference in their communities. The leadership programs offered will enhance the students’ opportunities to learn about themselves, grow their leadership potential and ability, and recognize the value of transferrable skills. 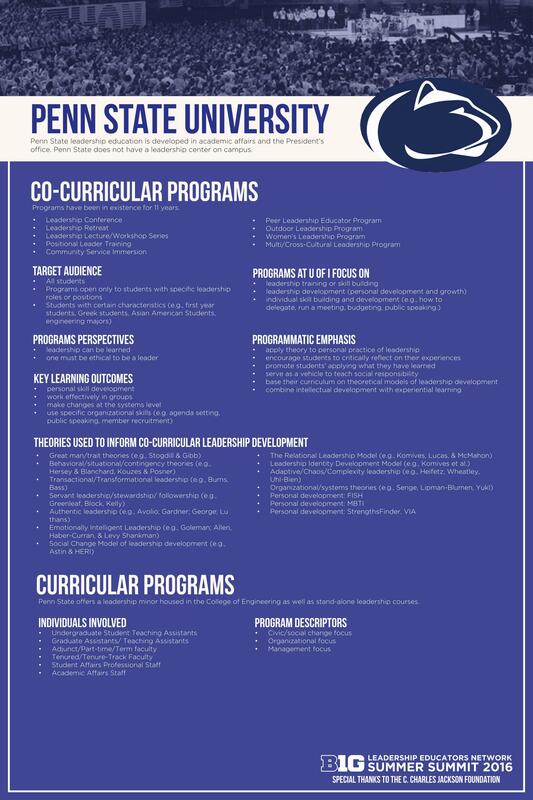 The leadership programs are specifically designed to enhance their co-curricular experience while fostering individual growth that leads to the development of productive and ethical citizens, and a healthier campus climate. 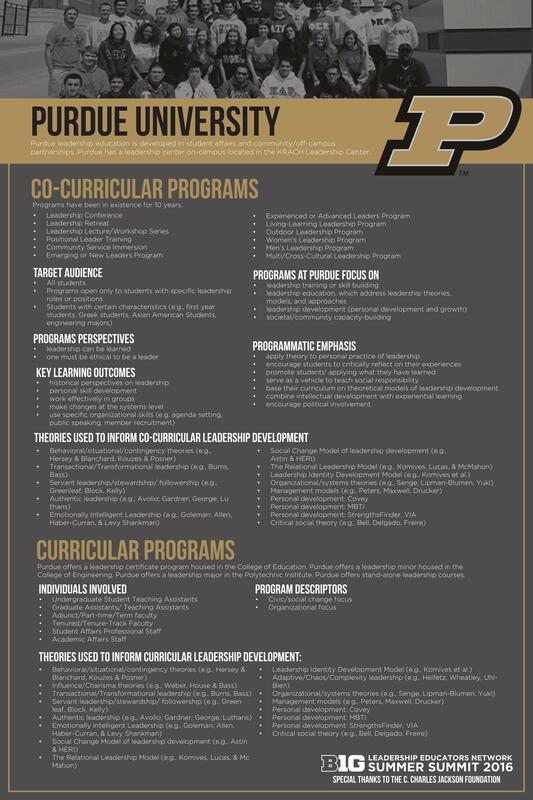 The Leadership and Professional Development Initiative (LPDI), builds on this strong reputation by leveraging and connecting class and out-of-class experiences to give students the best chance at success at Purdue and beyond. The LPDI prepares more students for career-oriented growth, helping them translate their experiences into better job placement and advancement opportunities. LPDI uses a competency-based approach, based on stakeholder feedback, to develop a framework that leverages curricular and co-curricular experiences. To cultivate and engage students through practical leadership skill development and involvement experiences.